Crocal provides multiple footer layouts that you can choose from. You can select various column layouts or have a single column if you wish. 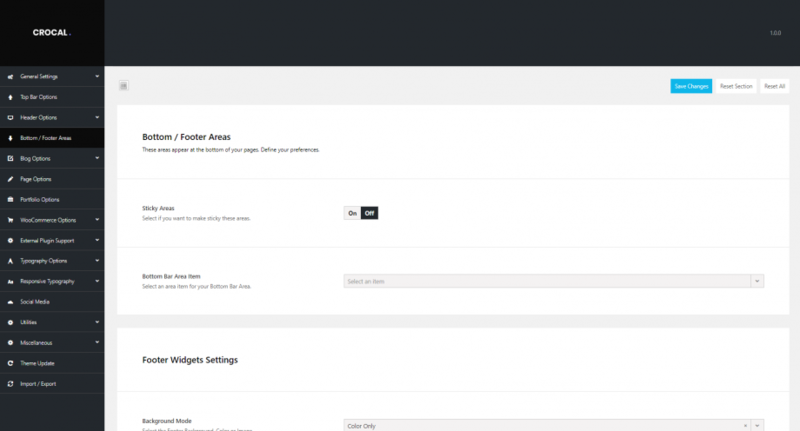 Go to Theme Options > Bottom/Footer Areas to build your footer. Sticky Areas: Select if you want to make sticky these areas (Bottom Area and Footer). Bottom Bar Area Item: Select the Area Item you wish to use in the Bottom Area. For more details about the Area Items, check this article. Background Mode: Select the background of your footer either a color or an image. Footer Widgets Visibility: You can enable/disable the visibility of your widgets area in the footer. Footer Full-Width: Select if you wish to have a full-width footer area or not. Footer Bar Visibility: You can enable/disable the footer bar visibility to add text (copyright), bottom menu and socials. Footer Bar Full-Width: You can select if you want a full-width footer bar area. Footer Bar Center: Choose the footer bar elements to be centered. Footer Copyright Visibility: Enable/disable the footer copyright visibility. Copyright Text: You can type your copyright text or anything else you want. Second Footer Area: This is the second position in the Footer Bar Area. You can easily add the Bottom Menu(assigned in Appearance > Menus) or socials.